Kimchi is the most popular Korean pickle. It is also popular in Japan. I love kimchi very much, too. However, not many Japanese know how to make kimchi. So I tried making kimchi with my wife and the hostel staff members. 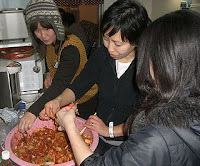 Under the supervision of Miyoung, we challenged to make kimchi at the hostel the other day. One day before, we had bought 5 heads of Chinese cabbage, some bunches of garlic, plenty of red chilli powder, some ginger, a bottle of fish sauce, some fermented small mysid shrimps (Ami-no-Shiokara) and some other kind of vegetables. Firstly we cut the Chinese cabbage and preserve it in salt in two big plastic bags overnight. The next day, we took the Chinese cabbage from the plastic bags and squeeze it patiently. On the other hand, we made kimchi paste (Yam-nyom). This is the most important part of making kimchi. The red chilli, grated garlic, grated ginger, fish sauce, shiokara, spring onion, radish strips, carrot strips, sugar, salt and some other spices were mixed with boiled starch glue made from sticky rice. They should be stirred in combine. Then the Yam-nyom and the Chinese cabbage were mixed and stirred again in combine. You can eat kimchi immediately. You can eat kimchi tomorrow, too. You can kimchi even one month later. Kimchi has various tastes of each time. 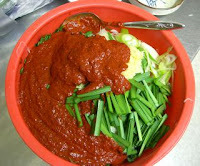 I am eating the kimchi every day and I sometimes have stomachache when I eat it too much. I feel the kimchi more tasty cause it is kimch we ourselves made.